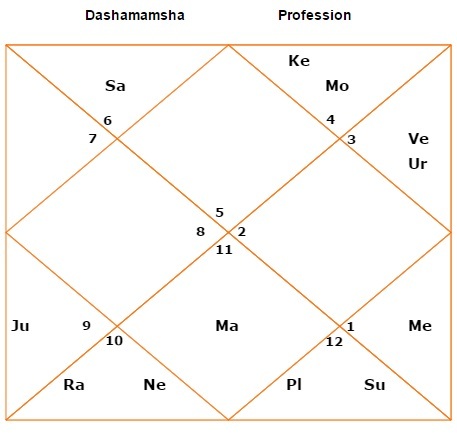 Dashamsha Chart (D-10) and way to read it. After D-9, today let’s look at D-10 Chart and the way to read it. D-10 is also considered as one of more important D-Charts as it deals with Career. It is actually the expansion of 10th house of your birth chart. All the factors related to Career must be confirmed in D-10 chart. Again, I would repeat that no chart overrules/supersedes any other chart. All charts work in harmony with each other and all charts, dashas and systems of Astrology can be used simultaneously to confirm the results from one another. Purpose of having so many ways of prediction is not to create conflict but to confirm things seen from one place to another. All have parallel existence and importance. It may sound weird but there are Astrologers who practice Vedic System of Predicting on Western Tropical Charts and based on Sidereal Transits. And they are as accurate as anyone can be. It all depends on your experience as Astrologer. Once you have seen 1000+ charts, things automatically start coming into mind. Also, D-10 will always be in harmony with D-1 as it is prepared out of D-1 only. The place where it can be a benefit is that you can pin-point the field of Career. Like, if D-1 is showing Career as Doctor, then D-10 can pin-point Doctor of which field. As calculations of D-10 and other D-charts from now onward will continue to be more and more complex, I feel it is worthy not to confuse people with how D-10 chart is calculated and made. Also, as all software and website provide all the D-charts with D-1, let’s directly jump to the way to read D-10 chart? In case, anyone is interested to learn the calculation part then feel free to apply under Teaching Services from Consultation/Services Section. I will be happy to help. As I said earlier, we can read any chart on its own. So, check the whole D-10 chart. 1st house of D-10 will show your career path, 2nd house will show the Wealth of Career, 3rd house will show the Efforts of Career, 4th house will show the peace of mind from Career etc. D-10 can also be seen for person’s status, fame and rank in the world. So, every house, planet and sign can be analysed like this. More importantly, we can emphasize on following criteria. Ascendant & Ascendant Lord – In any chart, always check the Ascendant & Ascendant Lord position. In D-10, it shows the Career Path and direction of Career Path. Like, in attached chart, Ascendant is Leo. So, person is supposed to achieve throne of King through his Career and Ascendant Lord Sun is in 8th house and in Pisces. So, he will achieve King like status through following a Career Path of Spirituality, Occult and Mysticism. 10th house and 10th house lord – As D-10 is basically an expansion of 10th house of Career from Birth Chart, it is imperative to check 10th house and 10th house lord of D-10. 10th house has Taurus sign there and Taurus’ lord Venus is in 11th house in Gemini. 11th house is Working for Higher Goals, Service to Humanity. Gemini is sign of Communication. So, this person’s Career is going into direction of serving higher humanitarian goals with his communication. 2nd house & 11th house and their lords – Now, career we follow in life, must give us some wealth in return to live a good life. So, we must check 2nd house of Wealth & its lord position and 11th house of earning & its lord position. This will give an idea from where money is coming in our life. For Leo Ascendant, 2nd house and 11th house both are ruled by Mercury through its sign Virgo and Gemini respectively. So, Mercury becomes an important planet related with Money for Leo people. This chart has Mercury in 9th house in Aries sign. 9th house is Religion, Philosophy, Higher Learning etc. Aries is Individuality/Uniqueness. Mercury is Communication. So, this person’s wealth will come when he communicates about religion, philosophy and higher knowledge in a unique way. No prizes for guessing. It is D-10 of Osho Rajneesh. Atma Karaka & Amatya Karaka - Atma Karaka is the planet with highest degree and Amatya Karaka is the planet with 2nd highest degree in birth chart, except Rahu & Ketu. Atma Karaka shows the destination of soul and Amatya Karaka shows the path by which you will reach the destination of soul. As per the birth chart of Osho, Jupiter was Atma Karaka and Saturn was Amatya Karaka. Jupiter is in 5th house in Sagittarius. So, it is indication of a destination related with Education, Higher Education, Religion and Philosophy. Saturn is in Virgo in 2nd house. Saturn is strictness, Virgo is being critical and analytical and 2nd house is Speech too. So, he reached his destination by being critical and harsh in his speech. As Saturn aspects 8th house of Occult, Mysticism and Sun in Pisces there, Saturn’s harsh speech was in the direction of Occult, Mysticism and Spirituality. Sun - Every D-chart has a karaka and D-10’s karaka is Sun. So, while reading D-10, we must look at Sun position. As we have covered Sun as Ascendant Lord, everything I said in 1st point applies here as is, i.e. he will achieve King like status through following a Career Path of Spirituality, Occult and Mysticism. Mahadasha & Antardasha (MD/AD) – Now, MD/AD won’t only impact D-1 chart but also D-charts. As we can see here, although he was quite popular in 1960s and 1970s, but he got real fame when he started his Atma Karaka Jupiter Dasha in 1979. Very next year, he flew to USA where he took on US Govt head-on. So, he reached destination of Career as soon as he started Jupiter MD. Aries, Cancer, Libra and Capricorn will aspect Taurus, Leo, Scorpio and Aquarius and vice-versa, except the sign right before/next to it. It means Aries will aspect Leo, Scorpio and Aquarius but it won’t aspect Taurus as it is right next to Aries. Likewise, for every sign. Gemini, Virgo, Sagittarius and Pisces will aspect each other. So, the concept is that when these signs aspect each other, planets sitting in each sign would also aspect each other in different signs, hence mutually impact each other. It increases the possibilities of predictions and events. Last, but not the least. While considering D-charts, keep in mind the concepts of Vargottama Planet, Vargottama Ascendant, Neech Bhang Raaj Yoga and other yogas. They all are inclusive. Hope this helps and understandable. Please let me know if there is any query through comments. @ VKP - I prefer reading D-1 1st, Thanks. Good day and advance new year wishes to u sir. Sir i always read your articles and I can see u give more importance to d1 chart than others. My question here is. For cancer asc wic is my chart...retro mars yogakarka sitting in 9th house. But when I check in bhava chalit it is in 8th house. 1) Based on this house placement which one decides my career, should i tk 9th house or 8th house? 2) Sun & retro mercury sits in 3rd house and have mutual aspect with retro mars. What kind of career does this shows based on your knowledge sir? 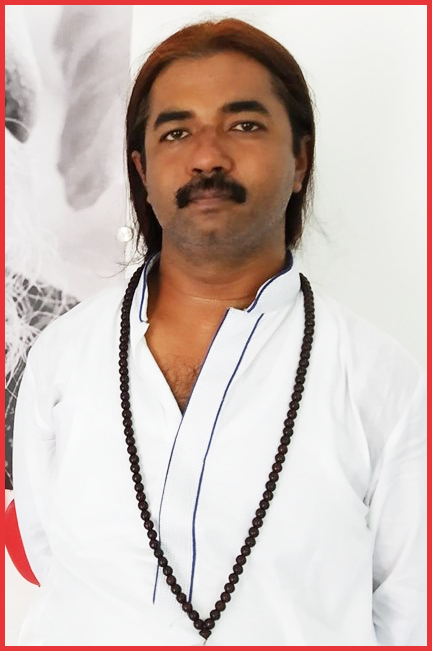 @ iqra - pls apply for consultation from this link - http://astrosaxena.com/consultation.